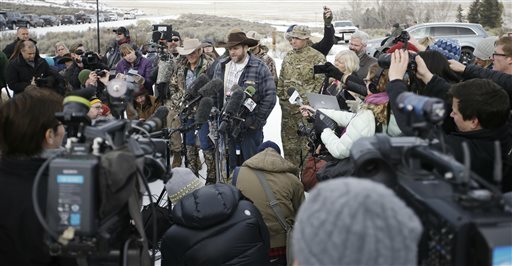 SALT LAKE CITY — As armed members of a militia group continue to occupy a federal building in Oregon’s Malheur National Wildlife Refuge, the Church of Jesus Christ of Latter-day Saints released a statement Monday condemning the action. Acting as one of the faces of the group before the media is Ammon Bundy, son of Nevada rancher Cliven Bundy, whose family and supporters were involved in an armed standoff with federal agents over grazing rights in 2014. Known members of the LDS Church, Cliven Bundy and his family have often said they believe God was involved in aspects of the 2014 standoff. The militia took over a building in the Malheur National Wildlife Refuge near Burns, Oregon, Saturday, following a protest over the sentencing of Oregon ranchers Dwight Hammond, 73, and Steven Hammond, 46, by a federal court. Ammon Bundy told reporters the Hammonds had been treated unfairly. The Hammonds were convicted of arson three years ago for fires on federal land in 2001 and 2006, one of which was set to cover up deer poaching, according to prosecutors. They said they lit the fires to reduce the growth of invasive plants and protect their property from wildfires. The men served their original sentences —three months for Dwight Hammond and one year for Steven Hammond — but an appeals court judge ruled the terms fell short of minimum sentences that require them to serve about four more years. Their sentences have been a rallying cry for the group, whose primarily male members said they want federal lands turned over to local authorities so people can use them free of federal oversight. The Hammonds turned themselves over to the custody of federal officials Monday to serve out their sentences in California. Also according The Associated Press, the Hammonds have distanced themselves from the group. The Bundys and others argue that the federal government has no right under the Constitution to control public lands, and therefore have chosen not to recognize its authority, or the authority of managing agencies like the Bureau of Land Management. They claim the states are the rightful owners and managers of the lands and that the federal government should surrender control to the states. Also standing with the group in Oregon at the wildlife refuge is Arizona rancher LaVoy Finicum, who told St. George News last year that he was following Cliven Bundy’s example and no longer paying his grazing fees to the BLM. Note that the church stays out of the issue itself. The church only says that peaceful means should be used to resolve the problems. I understand and agree with that. I hope the situation in Oregon stays peaceful and that the GOVERNMENT does not decide to hurt more people than they already have. They are good at killing and hurting people and a lot of media people Montel Williams example want to see violence. Shame on them and the BLM and other federal agencies who do not hesitate to use violence to get their way about things. One of the most violent, war mongering forces in our modern world is the US government. Lets all support our bloody, war making government- or maybe not. I think I will take the church’s advice, see the GOVERNMENT as the violent organisation it is and not support it’s violent actions. Can you read at all? The church statements said far more than “that peaceful means should be used to resolve the problems.” Most importantly, they say that such problems must be solved “according to the laws of the land.” Bundy and his gang of complete idiots are ignoring those laws, and so are you. The church supports the rule of law, and you do not. I think that makes you an apostate. I hope the GOVERNMENT does actually abide by the law of the land- the constitution. It has a habit of not doing that as the Hammonds and their friends can explain in detail to you. When the GOVERNMENT abides by the law of the land/constitution most of these problems will be solved. Peaceful law abiding governments usually don’t have too many problems with their citizens. I hope the GOVERNMENT decides to be peaceful and law abiding. Problem solved! The Constitution specifically provides a judiciary branch to decide matters of law. That branch has already ruled on the Hammonds’ and the Bundys’ cases, according the law, and both families lost. The system functioned exactly as the Constitution prescribed. Now, you and they, the losers fair and square, want to change the rules after the fact. It doesn’t work like that as much as you wish it did. You are a loser. Learn to deal with it. “Church leaders strongly condemn the armed seizure of the facility and are deeply troubled by the reports that those who have seized the facility suggest that they are doing so based on scriptural principles” Could they be any clearer? They are saying what the Bundy’s are doing, and what you support, is wrong. You can sugarcoat it anyway you want, but your church condemns your idiotic beliefs. Call in the snipers. Let’s have another Ruby Ridge. Anyone care what the cult condemns? All you Mormons better follow the leader and condemn the action too! what would of happened if these militia morons were muslim or even blacks, this whole thing would of been handled totally different. The locals don’t want the bundys or militia there, it seems like the bundys are looking for attention or some kind of welfare case land deal. If I showed up with an assault rifle on Federal land, I’m sure I’d get shot and be a Dead ladybug. I hope the feds go in there. guns blazing ! grenades. tear gas. assault choppers. Kill’em all ! Who cares what the lds church thinks about political issues? And who are they picking for the Superbowl? That’s just as newsworthy! I think the commenting church just wants it a matter of record of what their New stance is. The don’t want deal with the fallout for another situation like the old stance, a.k.a. the Mountain Meadows Massacre to deal with for the next 150 years.